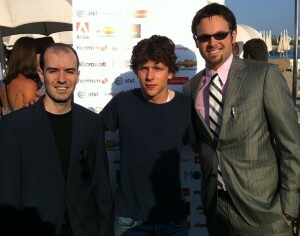 David Brashear, Jesse Eisenberg, & Ryan M. Pamplin at the MOFILM Cannes Lions Awards. AT&T Wireless & MOFILM flew David Brashear and me, Ryan Pamplin, to Cannes, France for the Cannes Lions International Festival of Creativity. We were honored to have Jesse Eisenberg (best known for his role as Mark Zuckerburg in The Social Network) present the 1st place award to us at the MOFILM Cannes Lions Awards for our AT&T Wireless commercial, “Opera”, which can be seen here. We would like to thank MOFILM, AT&T Wireless, our stars Cate Beehan, Dominic Dierkes, & DC Pierson, our DP Jon Peter, Nate Milton for simulating images on the phones, Hua Chen for designing the phone interfaces, Kandi Onwuama and Kassim Mughal for location scouting, J Restaurant & Lounge for the location, my girlfriend Kelly for her help on set, and the many others who’s contributions made this spot what it is. An extra special thank you goes to Dominic Dierkes and DC Pierson who are old friends of mine from New York City. I used to watch them do stand up in the back of a mexican restaurant every Saturday night. These guys have made it not only as talented actors but also as incredible comedy writers. They collaborated with David Brashear and me on the award-winning concept and they wrote the script. After the award ceremony Jesse Eisenberg told us about his website, OneUpMe.com, which is a social word game where players respond to a one liner in an effort to “One Up” each other. For example, the one liner is “She’s like a Corvette…” and the top response is “Her body type was never meant to carry kids”. It has developed quite a following.